Today we take you to the Wine of the Month Club through the back door. We taste hundreds of wines every month to pick out the best values for our members. Many of the wines are bottled and many are not. When they are still in tanks, we have the advantage of blending several different lots making the whole greater than the sum of its parts. 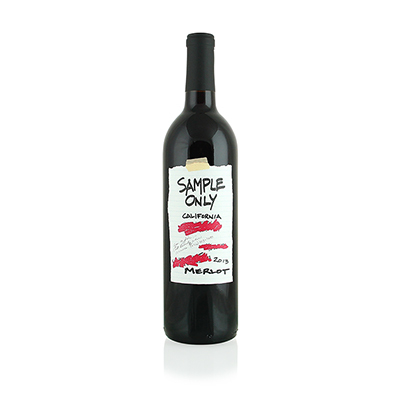 They are almost always labeled "Sample Only," so we figured that would be an apt name here. The most important attribute in a wine is balance. Most don't have it. But the way to get it is to add a wine to the blend that contributes what the original wine is lacking. For instance, a wine may have harsh tannins, so we find a wine with soft tannins and add bits of it at a time until we get the balance we're looking for. Our selection is a blend of several different lots of Merlot from Paso Robles. One had too much tannin, and another great structure, but not enough fruit. It's a game of inches. Sometimes an addition of 5% can change the makeup of the entire wine. That's why it's a slow and laborious process. Because we get so many samples each month, we have a lot to choose from, so the process always has a happy ending. We want our Merlot to taste like, well, Merlot. That means a touch of blueberry and spice, some vanilla from the oak aging and finally a medium finish with soft, yet enveloping tannins. Once all the boxes are checked, voila! We have our wine made from samples only.